The temperature has dropped, it’s dark when you get home from work and the last of the autumn leaves are clinging to the trees. And let’s not even mention Christmas… Yes, winter is nearly here! But now is the not the time to feel down! Why not banish those winter blues and give yourself something to look forward to – by booking yourself a break away to Cornwall in 2019? Forget researching the latest Xmas present, instead why not get your pick of preferred dates and accommodation by booking your 2019 getaway to Cornwall at Porth Beach? Our peak school holiday dates book up quickly, so now is the perfect time to secure your stay! Why choose Porth Beach in 2019? Our Newquay holiday park (/) is an extremely popular choice – and it’s easy to see why! We offer great value holidays in a stunning location, just 150 yards from the beach. So, whether you want to sit back and soak up the summer sun or sculpt the perfect sandcastle with your kids, you can get from your accommodation and onto the sand in a matter of minutes! Padstow May Day: The biggest day in Padstow’s calendar. It’s not unusual for 30,000 people to flock into this little town on the day when Padstonians from all over the world return to their roots. 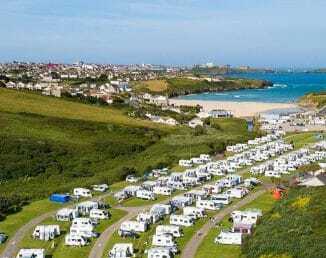 Our Newquay caravan park is the place to be in 2019! We’ve got a huge range of self-catering accommodation for you to choose from, with something for all tastes and budgets. Fancy bringing your tent our touring caravan? We’ve got a pitch for you, too! Or, why not try something different this year and book a break in our cosy glamping pods? Whatever your preference, Porth Beach is the place to see it all!